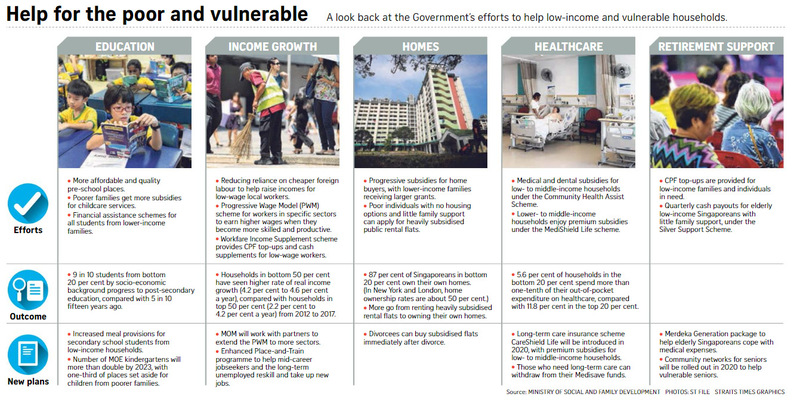 The Singapore system is not perfect, but it has performed better than most in improving the lives of poor and vulnerable families here, the Ministry of Social and Family Development (MSF) said in a first-of-its-kind report released yesterday. But the country is now at a crossroads, with the pace of economic development moderating and demands for social spending increasing, as the society is ageing, the report said. "We have to adapt our policies in response to changing circumstances and needs," it added. The report outlined how sustained efforts over the years had improved lives for the low-income - with more having their own homes and more students from poor families making it to tertiary education. "But the same measures now bring new challenges that we need to address, to ensure that stratification is not enshrined and social mobility continues to be spurred," the report said. "We will keep studying fresh ideas and approaches, including those from other societies, and try them out where they have promise, to help improve Singapore and the lives of Singaporeans," it said. "But we must not forget that trade-offs are unavoidable in social policy, and all too often, good intentions have led to counterproductive results." Social inequality and mobility have dominated the national discourse in recent weeks. For example, at an Institute of Policy Studies (IPS) event on Oct 25, Deputy Prime Minister Tharman Shanmugaratnam said safeguarding social mobility would get more difficult as Singapore progresses because that is the nature of a meritocratic system. "Those who succeed try to help their children and those who haven't succeeded find that the odds increase against them doing well in life," he said. A key step in tackling income inequality is to ensure that everyone - including those in the middle class - continues to progress, he said, giving the analogy of being on an escalator that has to keep moving so that everyone is better off. Education Minister Ong Ye Kung made a similar point about meritocracy at a separate event on Oct 24. Still, when it comes to educational progress, the results are encouraging, according to the 31-page paper. For instance, nine in 10 students from the bottom 20 per cent of families in terms of socio-economic backgrounds made it to post-secondary education today, up from five in 10 students 15 years ago. Besides education, the report listed government policies in areas such as employment, home ownership and healthcare to improve the lot of the needy. It said employment rates for Singaporeans and permanent residents, including older workers, have risen in the past decade. For workers aged 65 and older, the employment rate rose from 14.4 per cent in 2007 to 25.8 per cent last year. The Workfare Income Supplement has been one of the most effective schemes in getting people, especially older workers, to work, it noted. 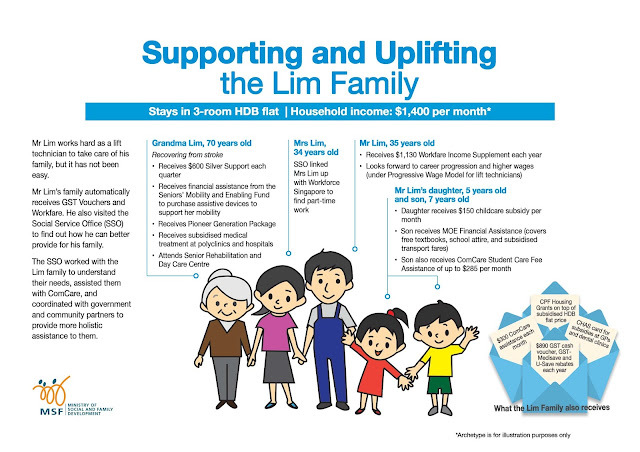 It encourages low-wage workers to work, by providing Central Provident Fund top-ups and cash supplements. More poor families are also moving out of heavily subsidised public rental flats and buying their own homes, and this is made possible by significant housing grants and affordable prices of flats. There were about 500 such families in 2013, and this doubled to almost 1,000 households last year. The number applying for a rental flat has also fallen by 44 per cent in the same time period. 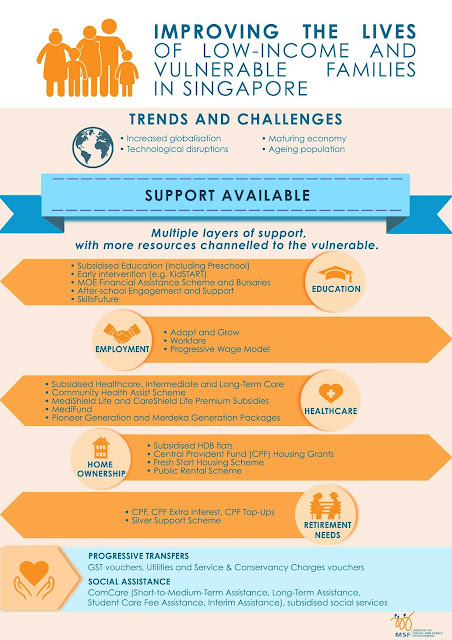 Using the Organisation for Economic Cooperation and Development method, Singapore's Gini coefficient, after taxes and transfers, fell from 0.388 in 2007 to 0.356 last year. The Gini coefficient is a measure of income inequality; the lower the score, the more equal a society. The report said the Government will continue to invest in education, help those who have lost their jobs to find new ones and assist seniors to cope with their medical expenses, among other plans to support low-income Singaporeans. An MSF spokesman said the report is the Government's contribution to the ongoing social discourse on helping the poor and vulnerable. She added: "We hope the paper will set a helpful context for deeper conversations and actions on the way forward. We also hope this will galvanise more partners to step forward and join us all in action." 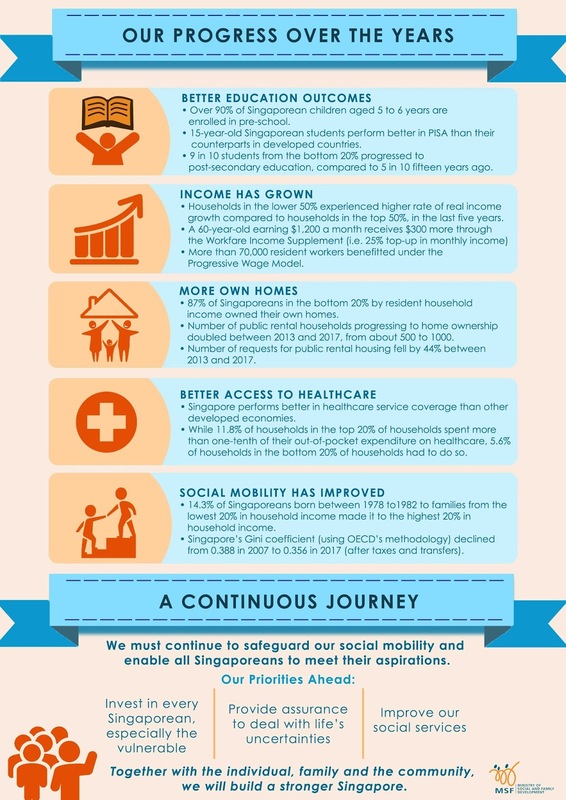 Mr Leonard Lim, an IPS research associate, said Singapore's Gini coefficient, after taxes and transfers, is lower or comparable to developed countries such as the United States - a testament to the Government's efforts to redistribute income. He added: "Education is the engine that powers social mobility. The moves to intervene early in education are most significant to me as they are an indication that this Government is intent on breaking any significant cycle of inter-generational transmission of poverty." Retired odd-job worker Henry Tan, 70, found himself at his wits' end six years ago when he suffered a stroke that left him unable to walk. The divorcee could no longer rely on doing odd jobs, such as painting or driving, to support himself, even after he finally regained some ability to walk two years later. 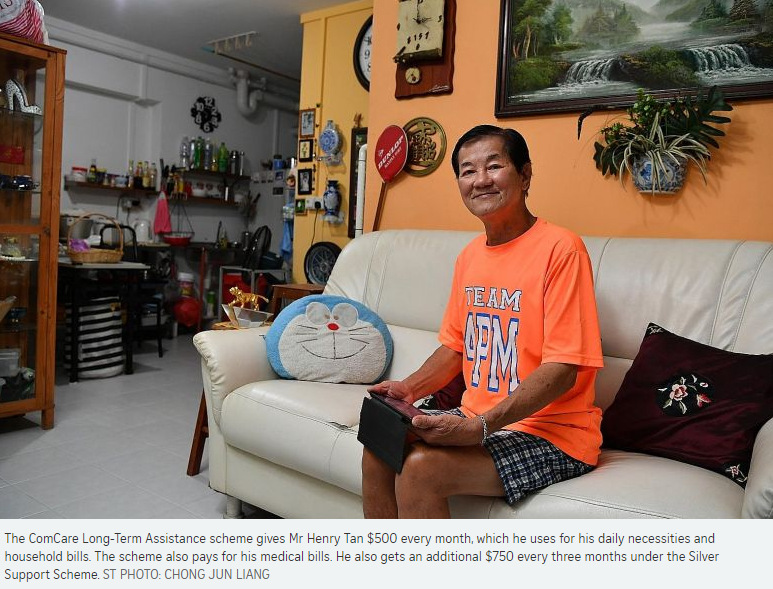 "My legs are very weak, I can walk a little bit, but I usually go out in my wheelchair," said Mr Tan, adding that he was not fit enough to work. As he is estranged from his family, including two grown-up daughters whom he has not seen in several decades, he had little choice but to seek more long-term help from the authorities. With a social worker's help, he applied for and was successfully put on the ComCare Long-Term Assistance scheme, which provides basic living expenses for the destitute who cannot work due to old age and illness, and who have little form of financial support. The scheme gives him $500 every month, which he uses for his daily necessities and to pay his household bills. Mr Tan also gets an additional $750 every three months under the Silver Support Scheme - which supports the bottom 20 per cent of elderly Singaporeans by giving them a cash payout, the amount of which is based on their housing type. He lives in a two-room public rental flat in Clementi with a niece who is working in sales. "Every month, money is quite tight, but it is okay now. I don't drink or gamble, I just smoke a little bit, so my money is just used to pay the bills," said Mr Tan. His medical bills are paid for by the Long-Term Assistance scheme, which is a relief as he also has diabetes and hypertension. "I take everything day by day," said Mr Tan. "If I worry, my heart won't be happy either, so that is why I let it be."